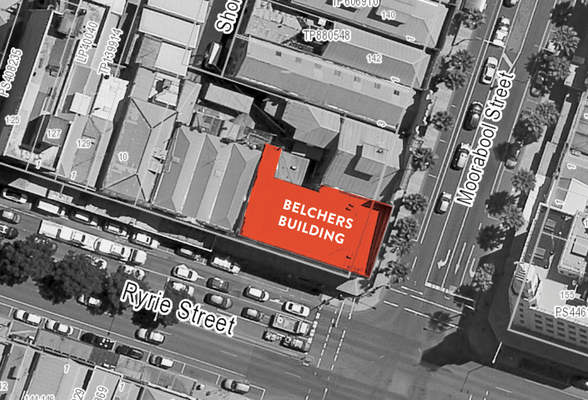 GOING DOWN: A council aerial image showing the location of the Belchers Corner building. Collapse risks have forced City Hall to order the demolition of a heritage building on central Geelong’s busiest corner. “Forensic testing” revealed that much of the Belchers Corner building on Moorabool and Ryrie Sts was riddled with “concrete cancer”, City Hall said. Basement walls supporting footpaths and roadways were “in danger of collapse” and the facade facing both streets was out of vertical and horizontal alignment. The building must be demolished by 31 December. Heritage planning overlays do not prevent demolition of buildings “considered a danger to life or property”, City Hall said. “Engineers’ assessments have shown that it would not be possible to maintain the façade of the building while demolishing the building due to insufficient foundations and concrete cancer through the entire structure. “The shoring up and parts of the demolition process will require closure of an area around the intersection of Moorabool and Ryrie Ss. It is anticipated that the demolition project managers will be working closely with VicRoads to ensure all traffic disruptions are planned and managed carefully and safely. City Hall chief Martin Cutter commended council staff’s handling of the building issue since safety fears forced its closure in July. “Every decision made by our municipal building surveyor puts safety first, and we have engaged a number of independent civil engineers to ensure we have had an accurate and thorough understanding of the building condition at all times,” Mr Cutter said. “We will continue to assess the temporary propping measures to ensure they have sufficiently stabilised the building to prevent collapse. This includes daily surveying and monitoring of the props to record any building movement readjust the steel props accordingly, where necessary. “We recognise that the demolition of a significant building in central Geelong is a great shame and a loss to the urban history and landscape of the City, but the welfare of our community comes first. “I can assure the greater Geelong community that their safety has not and will not be jeopardised in the testing and demolition of this building.